ArcSoft's PhotoImpression 6.5 Gold ($40, 14-day free trial) is a nicely featured program for organizing and editing photographs. 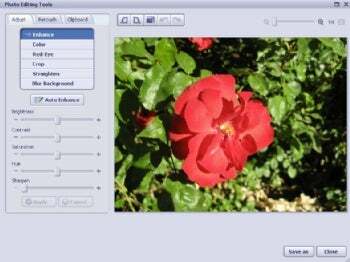 The tools are easy to use, though not very flexible, giving casual photographers what they need to manage and edit their photos. ArcSoft PhotoImpression includes a small range of standard editing tools to fix and enhance photos. The first time you use PhotoImpression 6.5 Gold, it searches the media files on the system and pulls them in. It took only a few minutes to gather together the few hundred photos on my few-years-old system running Windows XP Home. From there, it offers standard tools to group and organize photos, such as tagging and rating, and it includes batching so that you can resize, rename, or change the file type of many photographs at once. A tool I found surprisingly helpful was "Stacking," which allows you to stack pictures one on top of the other as you would a deck of cards, so that you can only see the top picture. This lets you group together the thumbnails of the same of similar pictures so that you don't have to scroll through as many pictures in a folder, making it easier to organize them. Choosing "Stack" pulls all of the selected thumbnails into the stack, which you can click on to open a separate screen that contains all of the stacked photos. You can organize and manage your videos in the same way as your photos, with tags and ratings, and the software includes a simple media player. But much of the software's functionality is geared toward still photos. PhotoImpression stumbles when it comes to sharing features, however. There's no link to Facebook or other social networking sites, and its Easy Email feature, which the software claims will automatically launch an e-mail program and attach a photo or photo album, didn't work with either Yahoo Mail or Hotmail, despite the fact that both were listed as supported applications. ArcSoft indicated that, while PhotoImpression 6.5 will continue to be available, they are replacing the program with their fuller-featured, and more expensive, MediaImpression line. They plan to relaunch their PhotoImpression line in the future, though timing is not set. If you don't need MediaImpression's additional features, it's probably worth holding off for the next incarnation, when we hope they can work out some of the kinks. PhotoImpression 6.5 Gold costs $40, with a two-week free trial. You can probably find equivalents for most of the individual image editing and photo management tools online for free, but it's helpful to have them in one place. If you're looking for software that has almost no learning curve and provides the basic care and feeding of digital photographs and you're not looking for extra sharing features, it's not a bad choice. But you might want to hold off until ArcSoft relaunches its line and fixes some technical issues.